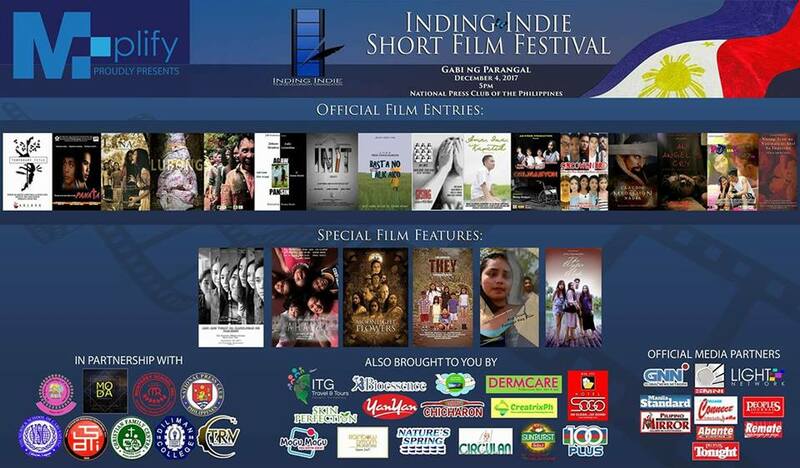 December is the month where Inding Indie Film Festival will honor this year's best, at the Awards Night to be held on December 4, 2017 at the National Press Club of the Philipines. Compared to last year, the number of participants for this year increased. From students to new directors. Some of this year's participants include Maranhig, Lana at Lubong Pelikula by Marvin Gabas, Gising ni Peter Polilio, Ama Ina Kapatid by Onie Luna, Cincowentro by Romm Burlat and Marvin Gabas, Agaw Pansin by Romm Burlat, Panata by Mark Anthony Balisi, Puchang Pag-ibig to by Raph Decena, An Angels Cry by John Ray Garcia, Noong Araw nang Maniwala si Abel sa Impyerno by John Ray Garcia, No Talk Ako by Joshua Asuncion, Obligasyon by Benny Andaya, Temporary Title by Joshua Asuncion and Init by Rian Simon Magtaan. This year's entries were reviewed by a unique set of judges including various private schools, and officials of the festival. The biggest TV networks ar expected to compete this year in the field of news and documentary. Last year, GMA 7 has raked multiple awards in the media category, with TV5 coming in second place. Everyone was surprised when the nominees included Gloria Romero, Ma. Isabel Lopez, Pilar Pilapil, Lou Veloso, Gabbi Garcia, Susan Africa and other notable actors. Special feature films are also for exhibition such as Moonlight Flowers, starting Rhea Usares, Eun Jin Kim and Jayzelle Estrada. Another film, Ano ang Tunay na Kahulugan ng Pag-ibig by Ryan Manuel Favis shares the screen with Kapirasong Daigdig megged by the same director. Last year's festival was a huge success thanks to its partnership with M-plify, their Marketing Arm headed by Migs Dela Rosa. The latter being an advocate for generating hope in the betterment of the Arts through film and had supported the film festival for four years running. Lolly Acosta, another avid supporter, stands in as the Corporate Communication Head, bringing in DWIZ Radio as the official media partner. Private schools and private companies who support the festival includes Diliman College, Monterey School, Christian Family Center, Diliman Preparatory, Youngrock School of Cabuyao, ITG Travel and tours, Ciculan, Mogu mogu, Sogo Hotel, Yoshinoya, Chicharon ni Juan, 100Plus, Rhicons Events Management, Sunbursts, Philippine Pharmaceutical Association of the Philippines (PHAP), Movements of Designers and Artists (MODA), Bioessence, Dermcare, Natures Spring, SMNI Group for TV and Radio, Pilipino Mirror, Katooga.PH, Creatrixph Travel and Tours, Spark and Wrench Catering and Cons Escapes Travel and Tours. For more details, simply visit their facebook page here.